Born in Sudbury, Ontario, this defenceman played his junior hockey with the Sudbury Wolves before being drafted by the Toronto Maple Leafs in 1976. After two seasons with the Leafs, he was traded to the Pittsburgh Penguins. In 1980-81 he won the Norris Trophy as the NHL's top defenceman and was selected to the First AlI-Star Team. 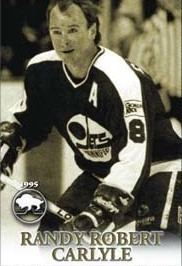 On March 5, 1984 he was traded by Pittsburgh to the Winnipeg Jets where he played in 564 games before retiring in 1993. His NHL career includes four NHL All-Star Games, 1055 games, 148 goals, 499 assists, 647 points. Randy Robert Carlyle also enjoyed a successful coaching career in the IHL, AHL and NHL.